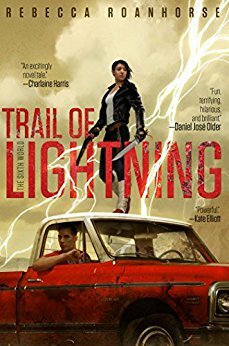 Trail of Lightning is an electric debut with a post-apocalyptic world, a kickass heroine, and her adrenaline-fueled ride through that landscape. After a spectacular and very likely supernatural apocalypse that has drowned much of the world, much of North America is underwater and much of the remainder that isn't is a mess. The land inside of what was the Navajo Reservation is protected by a quartet of magical walls. And yet even inside of the boundaries of the walls, in this new world, there are monsters, and monstrous people, and such dangers and threats must be addressed, and fought. That’s where Maggie Hoskie comes in. She’s been trained as a monster hunter by the very best, but she is new to fighting monsters on her own. And it is in the fighting monsters on her own that she is drawn into a plot that will not only gain her a partner, but also uncover a threat to the entire world inside the walls and the people who live there. Can Maggie protect herself, and those around her, when she must also restain an even greater monster--herself? And just what DID happen to her old mentor, anyhow? There is plenty to love in Trail of Lighting, and Maggie as a main character is front and center the heart of the novel and she makes the novel sing. An indigenous woman granted supernatural powers that are complicated and make her an outsider by their very nature, Maggie’s life as a newly solo monster hunter is a fraught one. The author writes her action beats very well, and when Maggie takes the stage as a fighter, the novel positively sings. Through those action beats, and the first person point of view, we get a really intense look at Maggie as a character, how she sees herself, how others do, and the sometimes fraught relationshop between those two visions. The second major character in the novel, Kai, a rather unconventional hero. Thanks to the nature of the character, and the plot, and the secrets that Kai is hiding, he is somewhat difficult to get a handle on as a character. I think that the author may have made Kai just a tad too slippery for readers to get a good enough purchase on for my taste. As the novel progresses, we get to see why Kai is the way he is and the relevance of that to the plot, but I think a little more hook on him would have been good. The worldbuilding is top notch and a leading light of the power of #ownvoices. There is an authenticity to the myths and legends made supernatural manifest fact within the Sixth World that the author presents here. This is a post-apocalyptic world whose suipernatural denizens, threats and features felt like the author was truly delving deep into her own culture, understanding it and presenting it to us in context and the richness of what is on offer. And much of it is new to most readers and rich with details and ideas that I was very happy to have the author explore. I particularly liked her interpretation of Coyote, the Trickster, who has an agenda for Maggie that only slowly becomes clear as the novel unfolds. But it is the things that go bump in the night, the entities that Maggic must encounter and fight, that shows the author’s invention the best. The worldbuilding also extends to the non supernatural elements as well. From the vividly described desert landscapes in what used to be the Navajo Reservation, to the people who inhabit it, I got a deep sense of place and people in reading the novel. As I read the novel, I found myself consulting Google Maps time and again, and turning on the Satellite image to get an even better view of where events took place. The author also invoked a more than mild desire for me to one day see the real life terrain and meet the people who live there. There are also a number of set piece locations that the novel is built around, that serve as hubs or tentpoles where the novel’s major scenes takes place. I particularly like Grace’s All-American, one of the few bars left, and built like a fortress. Grace and her family are quite the distinctive characters,. too. There are some small flaws in the novel, however. It is very clearly a first novel, and its pacing and plotting can get a little herky-jerky in places. The action beats as mentioned above are strong and rich, but sometimes the connective tissue.isn’t quite what it could be, and it sometimes meanders, without strong compensative character development at the same time. The novel, in fact, definitely does best in character development during those action beats. Still, I look forward to what Roanhorse does in the next Sixth World novels, and hope that some of the roughness of the first novel wears off and she only improves on the strengths of this novel. Find out more about Rebecca Roanhorse and her work in our Six Books Feature. Penalties : -1 for some first novel pacing and plotting issues.